I crack up looking at this picture. I lived here. Once upon a time, another lifetime ago, this was my apartment. The door on the left (your left), that was my door and the big window on the left, that was my bedroom. At the time, this was it: this was everything, this was the freakin' best thing ever. It was my first place, and the first time I was completely on my own in the big world (or as big as it got in Dunkirk, NY). 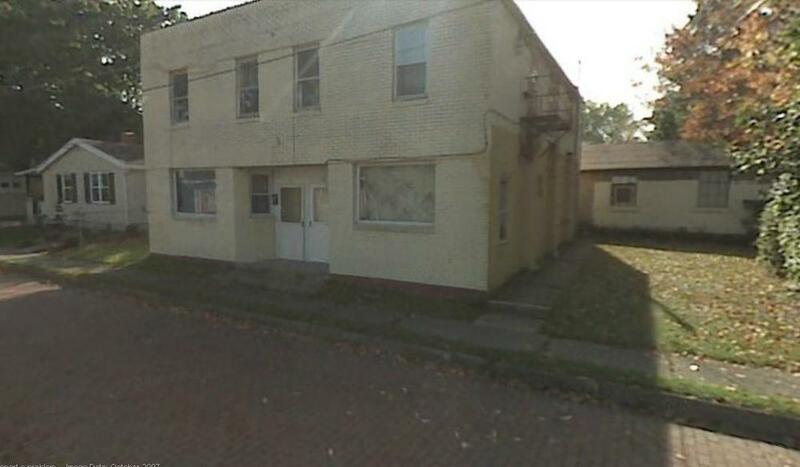 I lived here and worked two or three jobs and I paid the bills and food shopped and cooked and cleaned. Eventually my boyfriend moved in and together we lived in this dumpy little place on the ground floor with no windows, except for that big picture window that faced the street so the curtains were always drawn. From Howard Avenue it was a nice walk to the shore of Lake Erie (ironically, years later, when I was heavily into family tree research, I would come to find out my great-uncle Max lived in Dunkirk, on 2nd Street, barely half a mile from my apartment). But one of the best things about Howard Avenue was that it was adjacent to the railroad tracks that served the Norfolk Southern Railway. I grew up around trains and I love the sound of them going by. My childhood house in Croton-on-Hudson was clear across town from the Metro North Rail Yard, but you could still hear train whistles echoing around. It's a sound I've always associated with home. And in Dunkirk, trains rolled along the tracks just across the street from my bedroom window, long freight trains trundling through at two in the morning. Some people might find this unbearable. It felt like home to me. The kitchen was actually pretty good in the apartment. It had no dishwasher, but the landlord had just put in a new stove before I moved in, and it was a gas stove—something I'd never cooked on before. What the heck did I cook? I'm sure a lot of split chicken breasts marinated in Italian dressing and baked in the oven. Pasta, naturally. A thousand boxes of pierogies, at least. Salad, scrambled eggs, canned soup and grilled cheese, I'm sure. I remember trying to broil a steak once and it being a smoky disaster. I remember once splurging on baby lamp chops because I was missing my dad. And then there was creamed tuna and peas on toast. This was my boyfriend's contribution to the dinner menu, one of the few things, possibly the only thing he knew how to make. When he first suggested it, I gave him a skeptical look and a lot of teasing. Creamed tuna and peas on toast, what was this, the 1950's? Did he know how to make chipped beef and salmon loaf, too? He busied himself at the stove and I stayed out of the way, and when he came over to the couch with two plates balanced on his hands and a triumphant expression, I took my plate and nicely ate it. And it was absolutely fabulous. I used the last crust of toast to mop up the last bit of cream sauce and handed a pristine plate back to him. "You're making that again," I said, licking my fingers. He made it often. One memorable time he made it and as we were running toast around the plate rims, he stopped suddenly with a puzzled expression. "I didn't put the tuna in," he said. "I just realized I forgot to put the tuna in. This is just creamed peas on toast." I shrugged and ran my finger across his plate, catching what he'd missed. "It was terrific anyway." We're in touch on Facebook these days and I asked if he still had the recipe (I could Google it, sure, but what fun is that?). After realizing I was serious, he said he couldn't really remember it anymore, but we went back and forth on the process and I finally figured it couldn't be that different from creamed spinach so I adapted the white sauce from that. Melt 1 tbsp butter in a saucepan over medium heat. Whisk in flour. Cook for 1 minute, whisking constantly. Gradually whisk in milk. Whisk another 3 minutes until sauce thickens. Stir in salt, pepper, and half-and-half. Stir in tuna and peas. Put toast slices on plate and ladle tuna mixture over. Best eaten with a lover on the living room couch while watching TV, or standing over the kitchen sink, staring into space, remembering a lover. Photo is courtesy of A Good Appetite, who takes their recipe for CT&POT up several notches by preparing it with bacon, pearl onions and thyme. I suppose you could even marry this to a tuna melt and add cheese to the white sauce as well. Experiment with the bread, too: an artisan, multi-grain boule would be dynamite.